Gorumara National Park is situated on the bank of rivers Murti and Raidak in the terai region of Dooars on the foothills of Eastern Himalayas. Gorumara is famous for its Asiatic one horned Rhino, Asian Elephants, Bisons, Peacocks. This was a reserve forest since 1895. In the year 1949, the park was declared as Wildlife Sanctuary for its breeding population of one horned Indian Rhinoceros. On January 31, 1994, it was declared as a National Park. The 80 sq. km area of the Gorumara National Park is famous for its rich variety of flora & fauna. The park is located in the Malbazar subdivision of Jalpaiguri district, in the state of West Bengal in India. The Murti, Jaldhaka, and Indong rivers flow through the Park on the foothills of the Himalayan ranges in the North making the whole region picturesque. The park offers breathtaking landscape with its rivers and mountain ranges. Lataguri a small town adjacent to the park is the entry point. Day 1 – Arrivet NJP railhead / Bagdogra airport. Take a cab to Mongpong (35 kms. ), a quiet place on the bank of river Teesta. The forest Rest House at Mongpong offers a panoramic view of Mahananda Wild Life Sanctuary. Enjoy your break at Mongpong, watching colourful birds. A refreshing drive through the tea gardens and forests will take you to Lataguri (55kms. from Mongpong). Lataguri is a small Dooars town close to Gorumara National Park. Overnight stay at Lataguri. Day 2 – Visit to Gorumara forest in the morning. Back to your place of stay for lunch. After lunch optional evening walk to Khagrijan through nature trail. Overnight stay at – Lataguri. Day 3: Drive to Jaldapara via Chapramari forests. Check in the hotel / forest Bungalow at Jaldapara. In evening take a small local walk and feel the wilderness warmth. Overnight stay at Jaldapara. Day 4: Early morning drive inside the forest. Elephant ride inside Jaldapara grassland for viewing the famous one horned Rhino. Return to your place of stay for lunch. After lunch drive to Siliguri / NJP. Note: 1) Always obtain prior permission for entering the forest. 2) Arrange your Elephant Ride in advance. 3) During your stay at the forest, wake up early. At dawn, the forest offers its maximum. Average Rainfall : 382 cm. Gorumara National Park can be best approached from Lataguri, Though the best place to stay nearby is Murti, which is 8 kms away, a mere 15 minutes drive, and one of the entry gate i.e. the Jatraprasad falls nearby Murti itself, though the main Gorumara Gate is located at Lataguri. Lataguri is 14 Kms from Chalsa, 52 Kms from Jalpaiguri and 69 Kms from Siliguri. By Air – Bagdogra is the nearest airport situated in Jalpaiguri district, West Bengal which is about 80 km away from Gorumara Natinal Park. Bagdogra Airport is 13 kms from Siliguri. There are regular flights of Indian, Kingfisher, Spice jet, Go Air, Druk airways and Jet Airways from Kolkata, Delhi and Guwahati. Tourists can avail vehicles from the Prepaid Booth of the airport. By Road – Gorumara Natinal Park is well connected by road on National Highway No.31 from Siliguri (80 Kms approx.) which passes through Lataguri which is the gateway to Gourmara Natinal Park is 1 km away. Private Buses & cars, NBSTC buses are available from Siliguri to Lataguri which takes about 2 hrs from Siliguri. Tenzing Norgay Bus Terminus (Siliguri) is 74 kms away from Gorumara. Private & hired Vehicles are available from all the taxi stand, airport, railway station etc. Cooch Behar, Alipurduar, Malbazar, Chalsa and other towns of the region are well connected with the North Bengal State Transport Corporation which has its own bus services. The place is also connected by long distance bus routes to Siliguri, Jalpaiguri, Kolkata & Guwahati. By Rail – New Jalpaiguri Railway Station is the major railway station well connected with Kolkata, Chennai, Bangalore, Delhi, Guwahati. Nearest railway station from Lataguri is New Maynaguri which is 20 km and New Mal Junction which is 30 km away. Gorumara is accessible from the major rail stations at Siliguri, Jalpaiguri, New Jalpaiguri (NJP)( 72 Km), Alipurduar, Cooch Behar, Rajabhatkhawa, Birpara from where tourists can rent private jeeps or car by road through National Highway 31 to Lataguri, the gateway to the park. 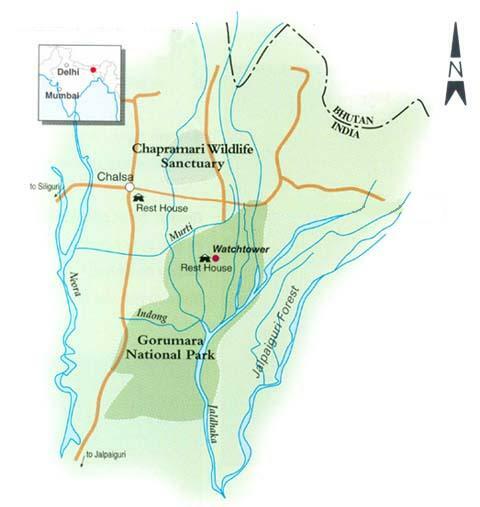 The entry fees to enter the Gorumara National Park is Rs.40/- per person. Other fees to be paid are the guide and parking fees. The park is closed on Thursdays. Prior permission has to be obtained from the forest department for elephant rides. The Park consists of savanna, grasslands and shrublands with deciduous forests of the tropical and subtropical moist broadleaf forests. Gorumara also consists of Sal forests with Common Teak, Rain Tree (Shirish), and Silk Cotton (Shimul) trees, siris, khair and Bamboo groves. The Gorumara National park is rich with varied species of animals. The park has recored approximately 50 species of mammals (carnivores and herbivores), 193 species of birds, 22 species of reptiles, 7 species of turtles, 27 species of fishes. Mammals – Indian Rhinoceros, Gaur (Indian Bison), Asian Elephant, Sloth bear, Chital and Sambar Deer are the large herbivores animals and Small herbivores animals like Barking deer, Hog deer, Malabar Giant Squirrel and Wild boar found in the Gorumara Natinal Park. The variety of carnivores animals found in the park are small in numbers. Only the Leopard represents the big cat family in the park. The presence of Tigers in the park can be witnessed very rarely. Birds: Gorumara National Park is famous for its bird inhabitants. Varied species of birds are found in the park which includes brilliant submontane forest birds like the scarlet minivet, sunbird, Asian paradise flycatcher, spangled drongo, Indian Shag, Darter, Egrets, Lesser Adjutant Stork, Lapwing and great Indian hornbill. Woodpeckers, pheasants, Peafowls, Minivets, Cuckoos, cormorants, Orioles, Pigeons and Mynas are commonly found in large numbers in the park. During the winter season migratory birds like Brahminy duck, Ibis, teals, Stork come here in the park to add beauty to the park. The park is also home to the night hunters like Owls and the Nightjars. Reptiles and amphibians – The park is home to a large number of snakes (venomous and non-venomous) which includes the Indian python, one of the largest snakes in the world and the king cobra – the world’s largest venomous snake. Watchtowers – The forest department has built several watchtowers inside and along the edges of the forests. These watchtowers are the best places to observe wildlife in their natural environment. The best way to watch wildlife at the park is to use powerful binoculars with night vision facilities at night, from the numerous well-located watchtowers at the park. In Gorumara Natinal Park there are 4 Watch towers namely Jatraprasad Watch Tower (named in the memory of a Kunki Elephant), Rhino Point (in front of the Gorumara Forest Rest House), Chandrachur Tower (Old Khunia) and the Chukchuki bird watching point which are located at various points to provide excellent view of wildlife in the park. The watchtower beside the Forest Rest House gives a panoramic view of the entire park and the Murti Valley. The elephant and jeep safaris are available at Gorumara National Park to explore the beauty of the wild nature.